"Plant food" redirects here. For the drug term, see Bath salts (drug). Six tomato plants grown with and without nitrate fertilizer on nutrient-poor sand/clay soil. One of the plants in the nutrient-poor soil has died. micronutrients: copper (Cu), iron (Fe), manganese (Mn), molybdenum (Mo), zinc (Zn), boron (B). Of occasional significance are silicon (Si), cobalt (Co), and vanadium (V). The nutrients required for healthy plant life are classified according to the elements, but the elements are not used as fertilizers. Instead compounds containing these elements are the basis of fertilizers. The macro-nutrients are consumed in larger quantities and are present in plant tissue in quantities from 0.15% to 6.0% on a dry matter (DM) (0% moisture) basis. Plants are made up of four main elements: hydrogen, oxygen, carbon, and nitrogen. Carbon, hydrogen and oxygen are widely available as water and carbon dioxide. Although nitrogen makes up most of the atmosphere, it is in a form that is unavailable to plants. Nitrogen is the most important fertilizer since nitrogen is present in proteins, DNA and other components (e.g., chlorophyll). To be nutritious to plants, nitrogen must be made available in a "fixed" form. Only some bacteria and their host plants (notably legumes) can fix atmospheric nitrogen (N2) by converting it to ammonia. Phosphate is required for the production of DNA and ATP, the main energy carrier in cells, as well as certain lipids. Micronutrients are consumed in smaller quantities and are present in plant tissue on the order of parts-per-million (ppm), ranging from 0.15 to 400 ppm DM, or less than 0.04% DM. These elements are often present at the active sites of enzymes that carry out the plant's metabolism. Because these elements enable catalysts (enzymes) their impact far exceeds their weight percentage. Fertilizers are classified in several ways. They are classified according to whether they provide a single nutrient (e.g., K, P, or N), in which case they are classified as "straight fertilizers." "Multinutrient fertilizers" (or "complex fertilizers") provide two or more nutrients, for example N and P. Fertilizers are also sometimes classified as inorganic (the topic of most of this article) versus organic. Inorganic fertilizers exclude carbon-containing materials except ureas. Organic fertilizers are usually (recycled) plant- or animal-derived matter. Inorganic are sometimes called synthetic fertilizers since various chemical treatments are required for their manufacture. 3 )2 · NH4NO3 • 10H2O). The main straight phosphate fertilizers are the superphosphates. "Single superphosphate" (SSP) consists of 14–18% P2O5, again in the form of Ca(H2PO4)2, but also phosphogypsum (CaSO4 • 2H2O). Triple superphosphate (TSP) typically consists of 44-48% of P2O5 and no gypsum. A mixture of single superphosphate and triple superphosphate is called double superphosphate. More than 90% of a typical superphosphate fertilizer is water-soluble. The main potassium-based straight fertilizer is Muriate of Potash (MOP). Muriate of Potash consists of 95-99% KCl, and is typically available as 0-0-60 or 0-0-62 fertilizer. These fertilizers are common. They consist of two or more nutrient components. Major two-component fertilizers provide both nitrogen and phosphorus to the plants. These are called NP fertilizers. The main NP fertilizers are monoammonium phosphate (MAP) and diammonium phosphate (DAP). The active ingredient in MAP is NH4H2PO4. The active ingredient in DAP is (NH4)2HPO4. About 85% of MAP and DAP fertilizers are soluble in water. NPK fertilizers are three-component fertilizers providing nitrogen, phosphorus, and potassium. NPK rating is a rating system describing the amount of nitrogen, phosphorus, and potassium in a fertilizer. NPK ratings consist of three numbers separated by dashes (e.g., 10-10-10 or 16-4-8) describing the chemical content of fertilizers. The first number represents the percentage of nitrogen in the product; the second number, P2O5; the third, K2O. Fertilizers do not actually contain P2O5 or K2O, but the system is a conventional shorthand for the amount of the phosphorus (P) or potassium (K) in a fertilizer. A 50-pound (23 kg) bag of fertilizer labeled 16-4-8 contains 8 lb (3.6 kg) of nitrogen (16% of the 50 pounds), an amount of phosphorus equivalent to that in 2 pounds of P2O5 (4% of 50 pounds), and 4 pounds of K2O (8% of 50 pounds). Most fertilizers are labeled according to this N-P-K convention, although Australian convention, following an N-P-K-S system, adds a fourth number for sulfur, and uses elemental values for all values including P and K.
The main micronutrients are molybdenum, zinc, boron, and copper. These elements are provided as water-soluble salts. Iron presents special problems because it converts to insoluble (bio-unavailable) compounds at moderate soil pH and phosphate concentrations. For this reason, iron is often administered as a chelate complex, e.g., the EDTA derivative. The micronutrient needs depend on the plant and the environment. For example, sugar beets appear to require boron, and legumes require cobalt, while environmental conditions such as heat or drought make boron less available for plants. Nitrogen fertilizers are made from ammonia (NH3), which is sometimes injected into the ground directly. The ammonia is produced by the Haber-Bosch process. In this energy-intensive process, natural gas (CH4) usually supplies the hydrogen, and the nitrogen (N2) is derived from the air. This ammonia is used as a feedstock for all other nitrogen fertilizers, such as anhydrous ammonium nitrate (NH4NO3) and urea (CO(NH2)2). Deposits of sodium nitrate (NaNO3) (Chilean saltpeter) are also found in the Atacama desert in Chile and was one of the original (1830) nitrogen-rich fertilizers used. It is still mined for fertilizer. Nitrates are also produced from ammonia by the Ostwald process. All phosphate fertilizers are obtained by extraction from minerals containing the anion PO43−. In rare cases, fields are treated with the crushed mineral, but most often more soluble salts are produced by chemical treatment of phosphate minerals. The most popular phosphate-containing minerals are referred to collectively as phosphate rock. The main minerals are fluorapatite Ca5(PO4)3F (CFA) and hydroxyapatite Ca5(PO4)3OH. These minerals are converted to water-soluble phosphate salts by treatment with sulfuric (H2SO4) or phosphoric acids (H3PO4). The large production of sulfuric acid as an industrial chemical is primarily due to its use as cheap acid in processing phosphate rock into phosphate fertilizer. The global primary uses for both sulfur and phosphorus compounds relate to this basic process. In the nitrophosphate process or Odda process (invented in 1927), phosphate rock with up to a 20% phosphorus (P) content is dissolved with nitric acid (HNO3) to produce a mixture of phosphoric acid (H3PO4) and calcium nitrate (Ca(NO3)2). This mixture can be combined with a potassium fertilizer to produce a compound fertilizer with the three macronutrients N, P and K in easily dissolved form. Potash is a mixture of potassium minerals used to make potassium (chemical symbol: K) fertilizers. Potash is soluble in water, so the main effort in producing this nutrient from the ore involves some purification steps; e.g., to remove sodium chloride (NaCl) (common salt). Sometimes potash is referred to as K2O, as a matter of convenience to those describing the potassium content. In fact, potash fertilizers are usually potassium chloride, potassium sulfate, potassium carbonate, or potassium nitrate. “Organic fertilizers” can describe those fertilizers with an organic — biologic — origin—that is, fertilizers derived from living or formerly living materials. Organic fertilizers can also describe commercially available and frequently packaged products that strive to follow the expectations and restrictions adopted by “organic agriculture” and ”environmentally friendly" gardening — related systems of food and plant production that significantly limit or strictly avoid the use of synthetic fertilizers and pesticides. The “organic fertilizer” products typically contain both some organic materials as well as acceptable additives such as nutritive rock powders, ground sea shells (crab, oyster, etc. ), other prepared products such as seed meal or kelp, and cultivated microorganisms and derivatives. Fertilizers of an organic origin (the first definition) include animal wastes, plant wastes from agriculture, compost, and treated sewage sludge (biosolids). Beyond manures, animal sources can include products from the slaughter of animals — bloodmeal, bone meal, feather meal, hides, hoofs, and horns all are typical components. Organically derived materials available to industry such as sewage sludge may not be acceptable components of organic farming and gardening, because of factors ranging from residual contaminants to public perception. On the other hand, marketed “organic fertilizers” may include, and promote, processed organics because the materials have consumer appeal. No matter the definition nor composition, most of these products contain less concentrated nutrients, and the nutrients are not as easily quantified. They can offer soil-building advantages as well as be appealing to those who are trying to farm / garden more “naturally”. 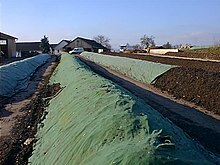 In terms of volume, peat is the most widely used packaged organic soil amendment. It is an immature form of coal and improves the soil by aeration and absorbing water but confers no nutritional value to the plants. It is therefore not a fertilizer as defined in the beginning of the article, but rather an amendment. Coir, (derived from coconut husks), bark, and sawdust when added to soil all act similarly (but not identically) to peat and are also considered organic soil amendments - or texturizers - because of their limited nutritive inputs. Some organic additives can have a reverse effect on nutrients — fresh sawdust can consume soil nutrients as it breaks down, and may lower soil pH — but these same organic texturizers (as well as compost, etc.) may increase the availability of nutrients through improved cation exchange, or through increased growth of microorganisms that in turn increase availability of certain plant nutrients. Organic fertilizers such as composts and manures may be distributed locally without going into industry production, making actual consumption more difficult to quantify. Fertilizers are commonly used for growing all crops, with application rates depending on the soil fertility, usually as measured by a soil test and according to the particular crop. Legumes, for example, fix nitrogen from the atmosphere and generally do not require nitrogen fertilizer. Fertilizers are applied to crops both as solids and as liquid. About 90% of fertilizers are applied as solids. The most widely used solid inorganic fertilizers are urea, diammonium phosphate and potassium chloride. Solid fertilizer is typically granulated or powdered. Often solids are available as prills, a solid globule. Liquid fertilizers comprise anhydrous ammonia, aqueous solutions of ammonia, aqueous solutions of ammonium nitrate or urea. These concentrated products may be diluted with water to form a concentrated liquid fertilizer (e.g., UAN). Advantages of liquid fertilizer are its more rapid effect and easier coverage. The addition of fertilizer to irrigation water is called "fertigation". Slow- and controlled-release involve only 0.15% (562,000 tons) of the fertilizer market (1995). Their utility stems from the fact that fertilizers are subject to antagonistic processes. In addition to their providing the nutrition to plants, excess fertilizers can be poisonous to the same plant. Competitive with the uptake by plants is the degradation or loss of the fertilizer. Microbes degrade many fertilizers, e.g., by immobilization or oxidation. Furthermore, fertilizers are lost by evaporation or leaching. Most slow-release fertilizers are derivatives of urea, a straight fertilizer providing nitrogen. Isobutylidenediurea ("IBDU") and urea-formaldehyde slowly convert in the soil to free urea, which is rapidly uptaken by plants. IBDU is a single compound with the formula (CH3)2CHCH(NHC(O)NH2)2 whereas the urea-formaldehydes consist of mixtures of the approximate formula (HOCH2NHC(O)NH)nCH2. Besides being more efficient in the utilization of the applied nutrients, slow-release technologies also reduce the impact on the environment and the contamination of the subsurface water. Slow-release fertilizers (various forms including fertilizer spikes, tabs, etc.) which reduce the problem of "burning" the plants due to excess nitrogen. Polymer coating of fertilizer ingredients gives tablets and spikes a 'true time-release' or 'staged nutrient release' (SNR) of fertilizer nutrients. Controlled release fertilizers are traditional fertilizers encapsulated in a shell that degrades at a specified rate. Sulfur is a typical encapsulation material. Other coated products use thermoplastics (and sometimes ethylene-vinyl acetate and surfactants, etc.) to produce diffusion-controlled release of urea or other fertilizers. "Reactive Layer Coating" can produce thinner, hence cheaper, membrane coatings by applying reactive monomers simultaneously to the soluble particles. "Multicote" is a process applying layers of low-cost fatty acid salts with a paraffin topcoat. 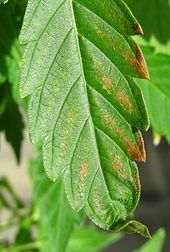 Foliar fertilizers are applied directly to leaves. The method is almost invariably used to apply water-soluble straight nitrogen fertilizers and used especially for high value crops such as fruits. Various chemicals are used to enhance the efficiency of nitrogen-based fertilizers. In this way farmers can limit the polluting effects of nitrogen run-off. Nitrification inhibitors (also known as nitrogen stabilizers) suppress the conversion of ammonia into nitrate, an anion that is more prone to leaching. 1-Carbamoyl-3-methylpyrazole (CMP), dicyandiamide, nitrapyrin (2-chloro-6-trichloromethylpyridine) and 3,4-Dimethylpyrazole phosphate (DMPP) are popular. Urease inhibitors are used to slow the hydrolytic conversion of urea into ammonia, which is prone to evaporation as well as nitrification. The conversion of urea to ammonia catalyzed by enzymes called ureases. A popular inhibitor of ureases is N-(n-butyl)thiophosphoric triamide (NBPT). Careful fertilization technologies are important because excess nutrients can be detrimental. Fertilizer burn can occur when too much fertilizer is applied, resulting in damage or even death of the plant. Fertilizers vary in their tendency to burn roughly in accordance with their salt index. Recently nitrogen fertilizers have plateaued in most developed countries. China although has become the largest producer and consumer of nitrogen fertilizers. Africa has little reliance on nitrogen fertilizers. Agricultural and chemical minerals are very important in industrial use of fertilizers, which is valued at approximately $200 billion. Nitrogen has a significant impact in the global mineral use, followed by potash and phosphate. The production of nitrogen has drastically increased since the 1960s. Phosphate and potash have increased in price since the 1960s, which is larger than the consumer price index. Potash is produced in Canada, Russia and Belarus, together making up over half of the world production. Potash production in Canada rose in 2017 and 2018 by 18.6%. Conservative estimates report 30 to 50% of crop yields are attributed to natural or synthetic commercial fertilizer. Fertilizer consumption has surpassed the amount of farmland in the United States. Global market value is likely to rise to more than US$185 billion until 2019. The European fertilizer market will grow to earn revenues of approx. €15.3 billion in 2018. Data on the fertilizer consumption per hectare arable land in 2012 are published by The World Bank. For the diagram below values of the European Union (EU) countries have been extracted and are presented as kilograms per hectare (pounds per acre). The total consumption of fertilizer in the EU is 15.9 million tons for 105 million hectare arable land area (or 107 million hectare arable land according to another estimate). This figure equates to 151 kg of fertilizers consumed per ha arable land on average for the EU countries. Use of fertilizers are beneficial in providing nutrients to plants although they have some negative environmental effects. The large growing consumption of fertilizers can affect soil, surface water, and groundwater due to dispersion of mineral use. It is important to be aware of the environmental effects in order to use them sparingly. Phosphorus and nitrogen fertilizers when commonly used have major environmental effects. This is due to high rainfalls causing the fertilizers to be washed into waterways. Agricultural run-off is a major contributor to the eutrophication of fresh water bodies. For example, in the US, about half of all the lakes are eutrophic. The main contributor to eutrophication is phosphate, which is normally a limiting nutrient; high concentrations promote the growth of cyanobacteria and algae, the demise of which consumes oxygen. Cyanobacteria blooms ('algal blooms') can also produce harmful toxins that can accumulate in the food chain, and can be harmful to humans. The nitrogen-rich compounds found in fertilizer runoff are the primary cause of serious oxygen depletion in many parts of oceans, especially in coastal zones, lakes and rivers. The resulting lack of dissolved oxygen greatly reduces the ability of these areas to sustain oceanic fauna. The number of oceanic dead zones near inhabited coastlines are increasing. As of 2006, the application of nitrogen fertilizer is being increasingly controlled in northwestern Europe and the United States. If eutrophication can be reversed, it may take decades before the accumulated nitrates in groundwater can be broken down by natural processes. Only a fraction of the nitrogen-based fertilizers is converted to plant matter. The remainder accumulates in the soil or is lost as run-off. High application rates of nitrogen-containing fertilizers combined with the high water solubility of nitrate leads to increased runoff into surface water as well as leaching into groundwater, thereby causing groundwater pollution. The excessive use of nitrogen-containing fertilizers (be they synthetic or natural) is particularly damaging, as much of the nitrogen that is not taken up by plants is transformed into nitrate which is easily leached. Nitrate levels above 10 mg/L (10 ppm) in groundwater can cause 'blue baby syndrome' (acquired methemoglobinemia). The nutrients, especially nitrates, in fertilizers can cause problems for natural habitats and for human health if they are washed off soil into watercourses or leached through soil into groundwater. Nitrogen-containing fertilizers can cause soil acidification when added. This may lead to decrease in nutrient availability which may be offset by liming. The concentration of cadmium in phosphorus-containing fertilizers varies considerably and can be problematic. For example, mono-ammonium phosphate fertilizer may have a cadmium content of as low as 0.14 mg/kg or as high as 50.9 mg/kg. The phosphate rock used in their manufacture can contain as much as 188 mg/kg cadmium (examples are deposits on Nauru and the Christmas islands). Continuous use of high-cadmium fertilizer can contaminate soil (as shown in New Zealand) and plants. Limits to the cadmium content of phosphate fertilizers has been considered by the European Commission. Producers of phosphorus-containing fertilizers now select phosphate rock based on the cadmium content. Phosphate rocks contain high levels of fluoride. Consequently, the widespread use of phosphate fertilizers has increased soil fluoride concentrations. It has been found that food contamination from fertilizer is of little concern as plants accumulate little fluoride from the soil; of greater concern is the possibility of fluoride toxicity to livestock that ingest contaminated soils. Also of possible concern are the effects of fluoride on soil microorganisms. The radioactive content of the fertilizers varies considerably and depends both on their concentrations in the parent mineral and on the fertilizer production process. Uranium-238 concentrations can range from 7 to 100 pCi/g in phosphate rock and from 1 to 67 pCi/g in phosphate fertilizers. Where high annual rates of phosphorus fertilizer are used, this can result in uranium-238 concentrations in soils and drainage waters that are several times greater than are normally present. However, the impact of these increases on the risk to human health from radinuclide contamination of foods is very small (less than 0.05 mSv/y). Steel industry wastes, recycled into fertilizers for their high levels of zinc (essential to plant growth), wastes can include the following toxic metals: lead arsenic, cadmium, chromium, and nickel. The most common toxic elements in this type of fertilizer are mercury, lead, and arsenic. These potentially harmful impurities can be removed; however, this significantly increases cost. Highly pure fertilizers are widely available and perhaps best known as the highly water-soluble fertilizers containing blue dyes used around households, such as Miracle-Gro. These highly water-soluble fertilizers are used in the plant nursery business and are available in larger packages at significantly less cost than retail quantities. Some inexpensive retail granular garden fertilizers are made with high purity ingredients. Attention has been addressed to the decreasing concentrations of elements such as iron, zinc, copper and magnesium in many foods over the last 50–60 years. Intensive farming practices, including the use of synthetic fertilizers are frequently suggested as reasons for these declines and organic farming is often suggested as a solution. Although improved crop yields resulting from NPK fertilizers are known to dilute the concentrations of other nutrients in plants, much of the measured decline can be attributed to the use of progressively higher-yielding crop varieties which produce foods with lower mineral concentrations than their less productive ancestors. It is, therefore, unlikely that organic farming or reduced use of fertilizers will solve the problem; foods with high nutrient density are posited to be achieved using older, lower-yielding varieties or the development of new high-yield, nutrient-dense varieties. Fertilizers are, in fact, more likely to solve trace mineral deficiency problems than cause them: In Western Australia deficiencies of zinc, copper, manganese, iron and molybdenum were identified as limiting the growth of broad-acre crops and pastures in the 1940s and 1950s. Soils in Western Australia are very old, highly weathered and deficient in many of the major nutrients and trace elements. Since this time these trace elements are routinely added to fertilizers used in agriculture in this state. Many other soils around the world are deficient in zinc, leading to deficiency in both plants and humans, and zinc fertilizers are widely used to solve this problem. High levels of fertilizer may cause the breakdown of the symbiotic relationships between plant roots and mycorrhizal fungi. In the US in 2004, 317 billion cubic feet of natural gas were consumed in the industrial production of ammonia, less than 1.5% of total U.S. annual consumption of natural gas. A 2002 report suggested that the production of ammonia consumes about 5% of global natural gas consumption, which is somewhat under 2% of world energy production. Ammonia is produced from natural gas and air. The cost of natural gas makes up about 90% of the cost of producing ammonia. The increase in price of natural gases over the past decade, along with other factors such as increasing demand, have contributed to an increase in fertilizer price. The greenhouse gases carbon dioxide, methane and nitrous oxide are produced during the manufacture of nitrogen fertilizer. The effects can be combined into an equivalent amount of carbon dioxide. The amount varies according to the efficiency of the process. The figure for the United Kingdom is over 2 kilogrammes of carbon dioxide equivalent for each kilogramme of ammonium nitrate. Nitrogen fertilizer can be converted by soil bacteria to nitrous oxide, a greenhouse gas. Through the increasing use of nitrogen fertilizer, which was used at a rate of about 110 million tons (of N) per year in 2012, adding to the already existing amount of reactive nitrogen, nitrous oxide (N2O) has become the third most important greenhouse gas after carbon dioxide and methane. It has a global warming potential 296 times larger than an equal mass of carbon dioxide and it also contributes to stratospheric ozone depletion. By changing processes and procedures, it is possible to mitigate some, but not all, of these effects on anthropogenic climate change. Methane emissions from crop fields (notably rice paddy fields) are increased by the application of ammonium-based fertilizers. 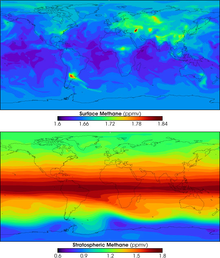 These emissions contribute to global climate change as methane is a potent greenhouse gas. In Europe problems with high nitrate concentrations in run-off are being addressed by the European Union's Nitrates Directive. Within Britain, farmers are encouraged to manage their land more sustainably in 'catchment-sensitive farming'. 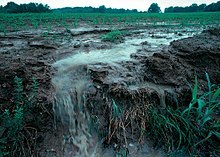 In the US, high concentrations of nitrate and phosphorus in runoff and drainage water are classified as non-point source pollutants due to their diffuse origin; this pollution is regulated at state level. Oregon and Washington, both in the United States, have fertilizer registration programs with on-line databases listing chemical analyses of fertilizers. In China, there have been regulations implemented by the government that want to control N fertilizers being used in farming. In 2008, Chinese governments have started to partially withdraw fertilizer subsidies, which also include contributions to fertilizer transportation, electricity and natural gas use in the industry. Because of this, professional farmers who run large-scale farms have already used less fertilizers since then under the fertilizer prices went up. If large-scale farms keep reducing their use of fertilizer subsidies, they have no choice but to optimize the fertilizer they have which would therefore gain an increase in both grain yield and profit. Two types of agricultural management practices include organic agriculture and conventional agriculture. The former encourages soil fertility using local resources to maximize efficiency. Organic agriculture avoids synthetic agrochemicals. Conventional agriculture uses all the components that organic agriculture does not use. Founded in 1812, Mirat, producer of manures and fertilizers, is claimed to be the oldest industrial business in Salamanca (Spain). Management of soil fertility has been the preoccupation of farmers for thousands of years. Egyptians, Romans, Babylonians, and early Germans all are recorded as using minerals and or manure to enhance the productivity of their farms. The modern science of plant nutrition started in the 19th century and the work of German chemist Justus von Liebig, among others. John Bennet Lawes, an English entrepreneur, began to experiment on the effects of various manures on plants growing in pots in 1837, and a year or two later the experiments were extended to crops in the field. One immediate consequence was that in 1842 he patented a manure formed by treating phosphates with sulfuric acid, and thus was the first to create the artificial manure industry. In the succeeding year he enlisted the services of Joseph Henry Gilbert, with whom he carried on for more than half a century on experiments in raising crops at the Institute of Arable Crops Research. The Birkeland–Eyde process was one of the competing industrial processes in the beginning of nitrogen based fertilizer production. This process was used to fix atmospheric nitrogen (N2) into nitric acid (HNO3), one of several chemical processes generally referred to as nitrogen fixation. The resultant nitric acid was then used as a source of nitrate (NO3−). A factory based on the process was built in Rjukan and Notodden in Norway, combined with the building of large hydroelectric power facilities. The 1910s and 1920s witness the rise of the Haber process and the Ostwald process. The Haber process produces ammonia (NH3) from methane (CH4) gas and molecular nitrogen (N2). The ammonia from the Haber process is then converted into nitric acid (HNO3) in the Ostwald process. The development of synthetic fertilizer has significantly supported global population growth — it has been estimated that almost half the people on the Earth are currently fed as a result of synthetic nitrogen fertilizer use. The use of commercial fertilizers has increased steadily in the last 50 years, rising almost 20-fold to the current rate of 100 million tonnes of nitrogen per year. Without commercial fertilizers it is estimated that about one-third of the food produced now could not be produced. The use of phosphate fertilizers has also increased from 9 million tonnes per year in 1960 to 40 million tonnes per year in 2000. A maize crop yielding 6–9 tonnes of grain per hectare (2.5 acres) requires 31–50 kilograms (68–110 lb) of phosphate fertilizer to be applied; soybean crops require about half, as 20–25 kg per hectare. Yara International is the world's largest producer of nitrogen-based fertilizers. Controlled-nitrogen-release technologies based on polymers derived from combining urea and formaldehyde were first produced in 1936 and commercialized in 1955. The early product had 60 percent of the total nitrogen cold-water-insoluble, and the unreacted (quick-release) less than 15%. Methylene ureas were commercialized in the 1960s and 1970s, having 25% and 60% of the nitrogen as cold-water-insoluble, and unreacted urea nitrogen in the range of 15% to 30%. In the 1960s, the Tennessee Valley Authority National Fertilizer Development Center began developing sulfur-coated urea; sulfur was used as the principal coating material because of its low cost and its value as a secondary nutrient. Usually there is another wax or polymer which seals the sulfur; the slow-release properties depend on the degradation of the secondary sealant by soil microbes as well as mechanical imperfections (cracks, etc.) in the sulfur. They typically provide 6 to 16 weeks of delayed release in turf applications. When a hard polymer is used as the secondary coating, the properties are a cross between diffusion-controlled particles and traditional sulfur-coated. ^ a b c d Dittmar, Heinrich; Drach, Manfred; Vosskamp, Ralf; Trenkel, Martin E.; Gutser, Reinhold; Steffens, Günter (2009). "Fertilizers, 2. Types". Ullmann's Encyclopedia of Industrial Chemistry. doi:10.1002/14356007.n10_n01. ISBN 978-3-527-30673-2. ^ "AESL Plant Analysis Handbook – Nutrient Content of Plant". Aesl.ces.uga.edu. Retrieved 11 September 2015. ^ H.A. Mills; J.B. Jones Jr. (1996). Plant Analysis Handbook II: A practical Sampling, Preparation, Analysis, and Interpretation Guide. ISBN 978-1-878148-05-6. ^ J. Benton Jones, Jr. "Inorganic Chemical Fertilisers and Their Properties" in Plant Nutrition and Soil Fertility Manual, Second Edition. CRC Press, 2012. ISBN 978-1-4398-1609-7. eBook ISBN 978-1-4398-1610-3. ^ a b Smil, Vaclav (2004). Enriching the Earth. Massachusetts Institute of Technology. p. 135. ISBN 978-0-262-69313-4. ^ "Summary of State Fertilizer Laws" (PDF). EPA. Retrieved 14 March 2013. ^ "Label Requirements of specialty and other bagged fertilizers". Michigan Department of Agriculture and Rural Development. Retrieved 14 March 2013. ^ "National Code of Practice for Fertilizer Description & Labelling" (PDF). Australian Government Department of Agriculture, Fisheries and Forestry. Archived from the original (PDF) on 28 February 2015. Retrieved 14 March 2013. ^ Livestock's Long Shadow: Environmental Issues and Options, Table 3.3. Retrieved 29 June 2009. United Nations Food and Agriculture Organization. ^ "Production & Inputs | Government of India, Department of Fertilizers, Ministry of Chemicals and Fertilizers". ^ "Supplemental technical report for sodium nitrate (crops)". www.ams.usda.gov. Retrieved 6 July 2014. ^ "Caliche Ore". www.sqm.com. Archived from the original on 14 July 2014. Retrieved 6 July 2014. ^ EFMA (2000). "Best available techniques for pollution prevention and control in the European fertilizer industry. Booklet No. 7 of 8: Production of NPK fertilizers by the nitrophosphate route" (PDF). www.fertilizerseurope.com. European Fertilizer Manufacturers’ Association. Retrieved 28 June 2014. ^ Haynes, R.J, R. Naidu (1998). "Influence of lime, fertilizer and manure applications on soil organic matter content and soil physical conditions: a review". Nutrient Cycling in Agroecosystems. 51 (2): 123–137. doi:10.1023/A:1009738307837 – via Springer Link. ^ "About Fertilizers Home Page". www.fertilizer.org. International Fertilizer Association. Retrieved 19 December 2017. ^ a b c J. B. Sartain, University of Florida (2011). "Food for turf: Slow-release nitrogen". Grounds Maintenance. ^ Yang, Ming; Fang, Yunting; Sun, Di; Shi, Yuanliang (2016). "Efficiency of two nitrification inhibitors (dicyandiamide and 3, 4-dimethypyrazole phosphate) on soil nitrogen transformations and plant productivity: a meta-analysis". Scientific Reports. 6 (1): 22075. Bibcode:2016NatSR...622075Y. doi:10.1038/srep22075. ISSN 2045-2322. PMC 4763264. PMID 26902689. ^ "Nitrogen Fertilization: General Information". Hubcap.clemson.edu. Archived from the original on 29 June 2012. Retrieved 17 June 2012. ^ Garrett, Howard (2014). Organic Lawn Care: Growing Grass the Natural Way. University of Texas Press. pp. 55–56. ISBN 978-0-292-72849-3. ^ "Understanding Salt index of fertilizers" (PDF). Archived from the original (PDF) on 28 May 2013. Retrieved 22 July 2012. ^ Smil, Vaclav (2015). Making the Modern World: Materials and Dematerialization. United Kingdom: John Wiley & Sons. ISBN 978-1-119-94253-5. ^ Smil, Vaclav (2012). Harvesting the Biosphere: What We Have Taken From Nature. Massachusetts Institute of Technology. ISBN 978-0-262-01856-2. ^ a b c d e Kesler and Simon, Stephen and Simon (2015). Mineral Resources, Economics and the Environment. Cambridge. ISBN 978-1-107-07491-0. ^ "Industry Stats - Fertilizer Canada". Fertilizer Canada. Retrieved 28 March 2018. ^ Stewart, W.M. ; Dibb, D.W.; Johnston, A.E. ; Smyth, T.J. (2005). "The Contribution of Commercial Fertilizer Nutrients to Food Production". Agronomy Journal. 97: 1–6. doi:10.2134/agronj2005.0001. ^ "Market Study Fertilizers - Europe". Ceresana.com. ^ "Environmental impact of nitrogen and phosphorus fertilisers in high rainfall areas". www.agric.wa.gov.au. Retrieved 9 April 2018. ^ Schmidt, JR; Shaskus, M; Estenik, JF; Oesch, C; Khidekel, R; Boyer, GL (2013). "Variations in the microcystin content of different fish species collected from a eutrophic lake". Toxins (Basel). 5 (5): 992–1009. doi:10.3390/toxins5050992. PMC 3709275. PMID 23676698. ^ John Heilprin, Associated Press. "Discovery Channel :: News – Animals :: U.N.: Ocean 'Dead Zones' Growing". Dsc.discovery.com. Archived from the original on 18 June 2010. Retrieved 25 August 2010. ^ "A Farmer's Guide To Agriculture and Water Quality Issues: 3. Environmental Requirements & Incentive Programs For Nutrient Management". www.cals.ncsu.edu. Archived from the original on 23 September 2015. Retrieved 3 July 2014. ^ State-EPA Nutrient Innovations Task Group (2009). "An Urgent Call to Action – Report of the State-EPA Nutrient Innovations Task Group" (PDF). epa.gov. Retrieved 3 July 2014. ^ Callisto, Marcos; Molozzi, Joseline; Barbosa, José Lucena Etham (2014). Eutrophication of Lakes. Eutrophication: Causes, Consequences and Control. pp. 55–71. doi:10.1007/978-94-007-7814-6_5. ISBN 978-94-007-7813-9. ^ C. J. Rosen; B. P. Horgan (9 January 2009). "Preventing Pollution Problems from Lawn and Garden Fertilizers". Extension.umn.edu. Archived from the original on 10 March 2014. Retrieved 25 August 2010. ^ Bijay-Singh; Yadvinder-Singh; Sekhon, G.S. (1995). "Fertilizer-N use efficiency and nitrate pollution of groundwater in developing countries". Journal of Contaminant Hydrology. 20 (3–4): 167–184. Bibcode:1995JCHyd..20..167S. doi:10.1016/0169-7722(95)00067-4. ^ "NOFA Interstate Council: The Natural Farmer. Ecologically Sound Nitrogen Management. Mark Schonbeck". Nofa.org. 25 February 2004. Archived from the original on 24 March 2004. Retrieved 25 August 2010. ^ Jackson, Louise E.; Burger, Martin; Cavagnaro, Timothy R. (2008). "Roots, Nitrogen Transformations, and Ecosystem Services". Annual Review of Plant Biology. 59: 341–363. doi:10.1146/annurev.arplant.59.032607.092932. PMID 18444903. ^ Knobeloch, L; Salna, B; Hogan, A; Postle, J; Anderson, H (2000). "Blue Babies and Nitrate-Contaminated Well Water". Environ. Health Perspect. 108 (7): 675–8. doi:10.1289/ehp.00108675. PMC 1638204. PMID 10903623. ^ Schindler, D. W.; Hecky, R. E. (2009). "Eutrophication: More Nitrogen Data Needed". Science. 324 (5928): 721–722. Bibcode:2009Sci...324..721S. doi:10.1126/science.324_721b. PMID 19423798. ^ Penn, C. J.; Bryant, R. B. (2008). "Phosphorus Solubility in Response to Acidification of Dairy Manure Amended Soils". Soil Science Society of America Journal. 72 (1): 238. Bibcode:2008SSASJ..72..238P. doi:10.2136/sssaj2007.0071N. ^ McLaughlin, M. J.; Tiller, K. G.; Naidu, R.; Stevens, D. P. (1996). "Review: the behaviour and environmental impact of contaminants in fertilizers". Soil Research. 34: 1–54. doi:10.1071/sr9960001. ^ Lugon-Moulin, N.; Ryan, L.; Donini, P.; Rossi, L. (2006). "Cadmium content of phosphate fertilizers used for tobacco production" (PDF). Agron. Sustain. Dev. 26 (3): 151–155. doi:10.1051/agro:2006010. Retrieved 27 June 2014. ^ Zapata, F.; Roy, R.N. (2004). "Use of Phosphate Rocks for Sustainable Agriculture: Secondary nutrients, micronutrients, liming effect and hazardous elements associated with phosphate rock use". www.fao.org. FAO. Retrieved 27 June 2014. ^ Syers JK, Mackay AD, Brown MW, Currie CD (1986). "Chemical and physical characteristics of phosphate rock materials of varying reactivity". J Sci Food Agric. 37 (11): 1057–1064. doi:10.1002/jsfa.2740371102. ^ Trueman NA (1965). "The phosphate, volcanic and carbonate rocks of Christmas Island (Indian Ocean)". J Geol Soc Aust. 12 (2): 261–286. Bibcode:1965AuJES..12..261T. doi:10.1080/00167616508728596. ^ Taylor MD (1997). "Accumulation of Cadmium derived from fertilizers in New Zealand soils". Science of the Total Environment. 208 (1–2): 123–126. Bibcode:1997ScTEn.208..123T. doi:10.1016/S0048-9697(97)00273-8. ^ a b c Chaney, R.L. (2012). Food safety issues for mineral and organic fertilizers. Advances in Agronomy. 117. pp. 51–99. doi:10.1016/b978-0-12-394278-4.00002-7. ISBN 9780123942784. ^ Oosterhuis, F.H. ; Brouwer, F.M. ; Wijnants, H.J. (2000). "A possible EU wide charge on cadmium in phosphate fertilisers: Economic and environmental implications" (PDF). dare.ubvu.vu.nl. Retrieved 27 June 2014. ^ Fertilizers Europe (2014). "Putting all the cards on the table" (PDF). www.fertilizerseurope.com. Retrieved 27 June 2014. ^ Wates, J. (2014). "Revision of the EU fertilizer regulation and cadmium content of fertilisers". www.iatp.org. Retrieved 27 June 2014. ^ a b Loganathan, P.; Hedley, M.J.; Grace, N.D. (2008). Pasture soils contaminated with fertilizer-derived cadmium and fluorine: livestock effects. Reviews of Environmental Contamination and Toxicology. 192. pp. 29–66. doi:10.1007/978-0-387-71724-1_2. ISBN 978-0-387-71723-4. PMID 18020303. ^ a b Cronin, S. J.; Manoharan, V.; Hedley, M. J.; Loganathan, P. (2000). "Fluoride: A review of its fate, bioavailability, and risks of fluorosis in grazed‐pasture systems in New Zealand". New Zealand Journal of Agricultural Research. 43 (3): 295–3214. doi:10.1080/00288233.2000.9513430. ^ Wilke, B.M. (1987). "Fluoride-induced changes in chemical properties and microbial activity of mull, moder and mor soils". Biology and Fertility of Soils. 5: 49–55. doi:10.1007/BF00264346. ^ Mortvedt, JJ; Beaton, JD. "Heavy Metal and Radionuclide Contaminants in Phosphate Fertilizers". Archived from the original on 26 July 2014. Retrieved 16 July 2014. ^ "TENORM: Fertilizer and Fertilizer Production Wastes". US EPA. 2016. Retrieved 30 August 2017. ^ Khater, A. E. M. (2008). "Uranium and heavy metals in phosphate fertilizers" (PDF). www.radioecology.info. Archived from the original (PDF) on 24 July 2014. Retrieved 17 July 2014. ^ Hussein EM (1994). "Radioactivity of phosphate ore, superphosphate, and phosphogypsum in Abu-zaabal phosphate". Health Physics. 67 (3): 280–282. doi:10.1097/00004032-199409000-00010. PMID 8056596. ^ Barisic D, Lulic S, Miletic P (1992). "Radium and uranium in phosphate fertilizers and their impact on the radioactivity of waters". Water Research. 26 (5): 607–611. doi:10.1016/0043-1354(92)90234-U. ^ Hanlon, E. A. (2012). "Naturally Occurring Radionuclides in Agricultural Products". edis.ifas.ufl.edu. University of Florida. Retrieved 17 July 2014. ^ Sharpley, A. N.; Menzel, R. G. (1987). The impact of soil and fertilizer phosphorus on the environment. Advances in Agronomy. 41. pp. 297–324. doi:10.1016/s0065-2113(08)60807-x. ISBN 9780120007417. ^ a b Wilson, Duff (3 July 1997). "Business | Fear In The Fields – How Hazardous Wastes Become Fertilizer – Spreading Heavy Metals On Farmland Is Perfectly Legal, But Little Research Has Been Done To Find Out Whether It's Safe | Seattle Times Newspaper". Community.seattletimes.nwsource.com. Retrieved 25 August 2010. ^ "Waste Lands: The Threat Of Toxic Fertilizer". Pirg.org. 3 July 1997. Retrieved 25 August 2010. ^ mindfully.org. "Waste Lands: The Threat of Toxic Fertilizer Released by PIRG Toxic Wastes Found in Fertilizers Cat Lazaroff / ENS 7may01". Mindfully.org. Archived from the original on 11 January 2002. Retrieved 25 August 2010. ^ a b c d Davis, D.R. ; Epp, M.D. ; Riordan, H.D. (2004). "Changes in USDA Food Composition Data for 43 Garden Crops, 1950 to 1999". Journal of the American College of Nutrition. 23 (6): 669–682. doi:10.1080/07315724.2004.10719409. ^ a b Thomas, D. (2007). "The mineral depletion of foods available to us as a nation (1940–2002) – A Review of the 6th Edition of McCance and Widdowson". Nutrition and Health. 19 (1–2): 21–55. doi:10.1177/026010600701900205. ^ Jarrell, W.M. ; Beverly, R.B. (1981). The Dilution Effect in Plant Nutrition Studies. Advances in Agronomy. 34. pp. 197–224. doi:10.1016/s0065-2113(08)60887-1. ISBN 9780120007349. ^ Fan, M. S.; Zhao, F. J.; Fairweather-Tait, S. J.; Poulton, P. R.; Dunham, S. J.; McGrath, S. P. (2008). "Evidence of decreasing mineral density in wheat grain over the last 160 years". Journal of Trace Elements in Medicine and Biology. 22 (4): 315–324. doi:10.1016/j.jtemb.2008.07.002. PMID 19013359. ^ Zhao, F. J.; Su, Y. H.; Dunham, S. J.; Rakszegi, M.; Bedo, Z.; McGrath, S. P.; Shewry, P. R. (2009). "Variation in mineral micronutrient concentrations in grain of wheat lines of diverse origin". Journal of Cereal Science. 49 (2): 290–295. doi:10.1016/j.jcs.2008.11.007. ^ Saltzman, A.; Birol, E.; Bouis, H. E.; Boy, E.; De Moura, F.F. ; Islam, Y.; Pfeiffer, W. H. (2013). "Biofortification: progress toward a more nourishing future". Global Food Security. 2: 9–17. doi:10.1016/j.gfs.2012.12.003. ^ a b c Moore, Geoff (2001). Soilguide - A handbook for understanding and managing agricultural soils. Perth, Western Australia: Agriculture Western Australia. pp. 161–207. ISBN 978-0-7307-0057-9. ^ "Zinc in Soils and Crop Nutrition". Scribd.com. 25 August 2010. Retrieved 17 June 2012. ^ Carroll and Salt, Steven B. and Steven D. (2004). Ecology for Gardeners. Cambridge: Timber Press. ISBN 978-0-88192-611-8. ^ Aleksander Abram; D. Lynn Forster (2005). "A Primer on Ammonia, Nitrogen Fertilizers, and Natural Gas Markets". Department of Agricultural, Environmental, and Development Economics, Ohio State University: 38. ^ Appl, Max (2000). "Ammonia, 2. Production Processes". Ullmann's Encyclopedia of Industrial Chemistry. Weinheim, Germany: Wiley-VCH. pp. 139–225. doi:10.1002/14356007.o02_o11. ISBN 978-3-527-30673-2. ^ Sawyer JE (2001). "Natural gas prices affect nitrogen fertilizer costs". IC-486. 1: 8. ^ "Table 8—Fertilizer price indexes, 1960–2007". Archived from the original on 6 March 2010. ^ Sam Wood; Annette Cowie (2004). "A Review of Greenhouse Gas Emission Factors for Fertiliser Production". IEA Bioenergy IEA Bioenergy. ^ Gruber, N; Galloway, JN (2008). "An Earth-system perspective of the global nitrogen cycle". Nature. 451 (7176): 293–296. Bibcode:2008Natur.451..293G. doi:10.1038/nature06592. PMID 18202647. ^ Roy, R. N.; Misra, R. V.; Montanez, A. (2002). "Decreasing reliance on mineral nitrogen-yet more food" (PDF). AMBIO: A Journal of the Human Environment. 31 (2): 177–183. doi:10.1579/0044-7447-31.2.177. Archived from the original (PDF) on 1 April 2015. Retrieved 3 July 2014. ^ Bodelier, Paul, L.E. ; Peter Roslev3, Thilo Henckel1 & Peter Frenzel1 (November 1999). "Stimulation by ammonium-based fertilizers of methane oxidation in soil around rice roots". Nature. 403 (6768): 421–424. Bibcode:2000Natur.403..421B. doi:10.1038/35000193. PMID 10667792. ^ Banger, K.; Tian, H.; Lu, C. (2012). "Do nitrogen fertilizers stimulate or inhibit methane emissions from rice fields?". Global Change Biology. 18 (10): 3259–3267. Bibcode:2012GCBio..18.3259B. doi:10.1111/j.1365-2486.2012.02762.x. PMID 28741830. ^ European Union. "Nitrates Directive". ^ Defra. "Catchment-Sensitive Farming". Archived from the original on 30 June 2011. ^ "Polluted Runoff: Nonpoint Source Pollution". EPA. Retrieved 23 July 2014. ^ "Washington State Dept. of Agriculture Fertilizer Product Database". Agr.wa.gov. 23 May 2012. Retrieved 17 June 2012. ^ Gomiero, T.; D. Pimental & M.G Paoletti (2011). "Environmental Impact of Different Agricultural Management Practices: Conventional vs. Organic Agriculture". Critical Reviews in Plant Science. 30 (1–2): 95–124. doi:10.1080/07352689.2011.554355 – via Taylor & Francis Online. ^ This article incorporates text from a publication now in the public domain: Chisholm, Hugh, ed. (1911). "Lawes, Sir John Bennet" . Encyclopædia Britannica (11th ed.). Cambridge University Press. ^ Aaron John Ihde (1984). The development of modern chemistry. Courier Dover Publications. p. 678. ISBN 978-0-486-64235-2. ^ G. J. Leigh (2004). The world's greatest fix: a history of nitrogen and agriculture. Oxford University Press US. pp. 134–139. ISBN 978-0-19-516582-1. ^ Trevor Illtyd Williams; Thomas Kingston Derry (1982). A short history of twentieth-century technology c. 1900-c. 1950. Oxford University Press. pp. 134–135. ISBN 978-0-19-858159-8. ^ Glass, Anthony (September 2003). "Nitrogen Use Efficiency of Crop Plants: Physiological Constraints upon Nitrogen Absorption". Critical Reviews in Plant Sciences. 22 (5): 453–470. doi:10.1080/713989757. ^ Commercial fertilizers increase crop yields . Accessed 9 April 2012. ^ Vance, Carroll P; Uhde-Stone & Allan (2003). "Phosphorus acquisition and use: critical adaptations by plants for securing a non renewable resource". New Phytologist. 157 (3): 423–447. doi:10.1046/j.1469-8137.2003.00695.x. JSTOR 1514050. ^ "Mergers in the fertiliser industry". The Economist. 18 February 2010. Retrieved 21 February 2010. Wikimedia Commons has media related to Fertilizers. Wikisource has the text of the 1920 Encyclopedia Americana article Fertilizers.